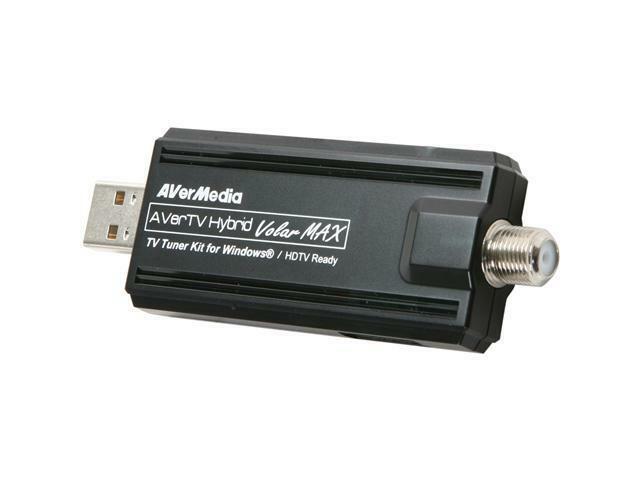 Turn your PC or laptop into TV with the AVerMedia MTVHVMXSK USB TV tuner. This external tuner turns your display into a digital television as it receives the latest over-the-air ATSC broadcast digital High Definition video and being able to display unencrypted digital cable signals plus NTSC analog signal. Featuring the sleek and compact size of a USB thumb drive, the AVerMedia MTVHVMXSK is a perfect travel mate with you on the road. Just slip it into your carry case and enjoy the show from wherever you are. Enjoy HD/SD TV and FM Radio on Your Computer The AVerMedia MTVHVMXSK turns your computer into a true media center that receives worldwide analog TV, unencrypted digital ClearQAM cable TV, digital ATSC broadcasts, complementing your digital multimedia experience. HD 1080i Support The AVerMedia MTVHVMXSK supports high definition quality up to 1080i for a true high-definition TV watching experience. Portable Design The sleek, compact AVerMedia MTVHVMXSK is fully powered via USB without the need for a power cord or a bulky power adapter for the ultimate portability. the AVerTV Hybrid Volar MAX is the ideal travel mate for viewing High Definition TV on the go. With Microsoft Windows Media Center, users will enjoy breathtaking and glorious TV viewing. watching Free Over-the-Air Digital TV programs, you can easily use the TimeShift features to control HDTV programs on your PC. Pros: lost on shipping but Newegg helped me replace it. Thanks NEWEGG. great customer service. so helpful on the phone. Cons: a little shipping issue. but... it was resolved. Pros: Worked great when it worked. Cons: Failed after about 8 months. USB tuner would not tune all available channels and became extremely hot. Eventually died. I have other AverMedia tuners (Pcie cards) that have been working perfectly for years. Other Thoughts: Disappointed in AverMedia. From my past experience I expected better quality. Pros: The setup when perfectly! I'm running Windows 7 64bit Home Premium. My dad bought me this for Christmas 2013 (I'm his son writing this) and I must say this is a great gift. Despite what Newegg says, this does have a FM tuner. HD channels are very clear too. Cons: The unit is a little finicky about signal quality so my antenna has to be high up. The biggest problem (and it's not that bad) is that the only program it runs with is Windows Media Center. I have laptop that runs Windows 7 Starter and I can't find any (free) programs that will receive TV on my laptop. But then the AVerMedia website does say that it only works with Windows Media Center. Other Thoughts: I would recommend this to a friend! Pros: Win 7 Media Center will auto-detect this tuner and install the appropriate driver automatically, no driver disk supplied, no supplier download needed. Cons: 6 inch USB extension is only supplied accessory, all others (remote, A/V dongle, antenna) are optional, but they are reasonably priced and available at AverMedia website. Other Thoughts: Device remains cool during even extended use. Blue LED lights up when tuner is active. Pros: My knowledge is fairly high for computers, and electronics. Where I have 4 TV's using 1 antenna to clearly pick up 30 stations, programming the TV's were a breeze!!! As for this lil' gadget, I felt frustrated, incompetent, ignorant, insulted and found myself laughing hysterically (without drool) as I realized this lil thing kicked my nerd-like-mind... lol After a lot of trouble, and searching, I was finally able to find the correct drivers (I think that has a lot to do with my issue, I wanted to use it on an XP MCE OS.) Finding that it wasn't as easy as I had hoped (Universal drivers do not function for my computer, I had to go down to the XP only driver). The guide still doesn't download (I plan to clean install my PC, or upgrade it to Win7 to give this a fair chance for simplicity. Great price, great service as far as Newegg! Their Open-Box makes it too easy to start that would be project today! I feel this is an avenue that will be worth learning about in any case, so I recommend this to anyone and everyone if they want to watch those TV shows that are only one while they work or sleep! It will prove to be well worth all the "Google" searching (or whatever search engine you prefer to utilize!). Long of the short: It works great, just requires a ton of patience and learning/reading/searching for older OS's!!! Cons: It seems to get warm, so give this lil gadget some room to breath. When your software says no channels detected, don't jump to conclusions it's just not clearly stated how to scan for channels (not even sure if that is an option)! I had to add my channels (99% if not 100% of the channels now days are digital so keep that in mind before you try to add an analog channel)!!! Utilize TV fool to find your REAL RF Channel Numbers, but start your adding with the Virtual Channel Number it will ask for the RF Channel after you enter the Virtual Channel! Long of the short here, no obvious channel scan! Gets warm, but I think cheaper and more expensive models do as well, if not get very hot! Pros: I just got this tv tuner, and the picture quality is great. Pros: Works great and has done so for over a month. Cons: There is a lag time of about 3 seconds with the device displaying live TV and clicking live TV in Media Center.